ClickGiant is a digital marketing agency most known for SEO. But what exactly does that mean these days? It means that we produce great content first and foremost—that also happens to rank extremely well. Through powerful content marketing campaigns, we have achieved giant results for our clients. We always love to share our results with the marketing world (and OK, maybe show off a bit while we’re at it). Take a look at what we’ve been able to achieve, and learn how you can get similar results. 1. Blow your mind with crystal clear, step-by-step, simple guidelines on how we implement content marketing strategies and services for our clients. 2. Blow your mind with the crystal clear results our clients have enjoyed after our content marketing campaigns were implemented. 3. Blow your mind with 6 Sensational SEO Projects to highlight the key components of an effective SEO content marketing campaign. 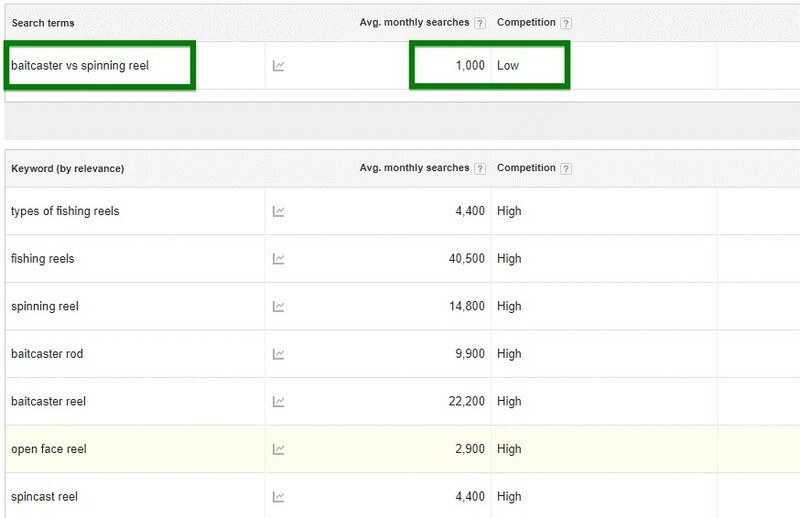 • Keyword Research – Finding “low-competition” queries to target. • Evaluating Content Tilt – Determining if it fits the brand’s content strategy. • Analyzing Existing Content – Can we improve upon what exists? • Content Strategy & Placement – Service Page? Blog? Article? Something else? • Tracking Rankings – Positions, variations, answer boxes. • Showing Results – Number of visits to the website. So, let’s get right into it. 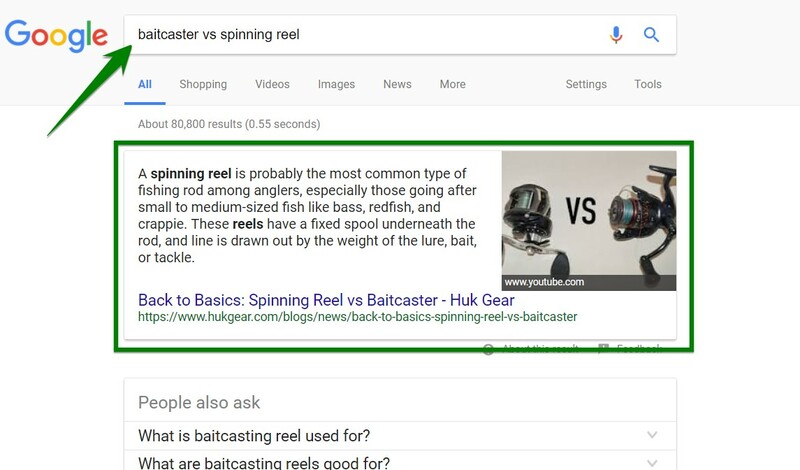 We’ll be reviewing essential factors of powerful SEO content strategies through our actual campaigns for brands including Nectar Sunglasses, HUK Performance Fishing, Scout Boats, Victor Barbone, Bits of Lace & BoatLIFE. Keyword Research – What’s being searched and how often? What’s the competition level? Does it match our content tilt? Can we improve upon what’s been published? 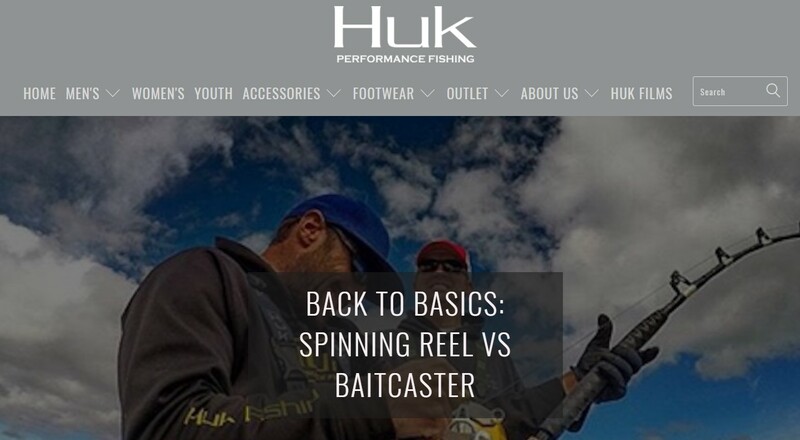 When running through this process for HUK Performance Fishing, the term “baitcaster vs spinning reel” stood out to us. It is searched 1,000 times per month, has a low competition level and fits our content tilt very well. This is a perfect topic to provide fisherman with valuable, informative content while also introducing them to the HUK brand. 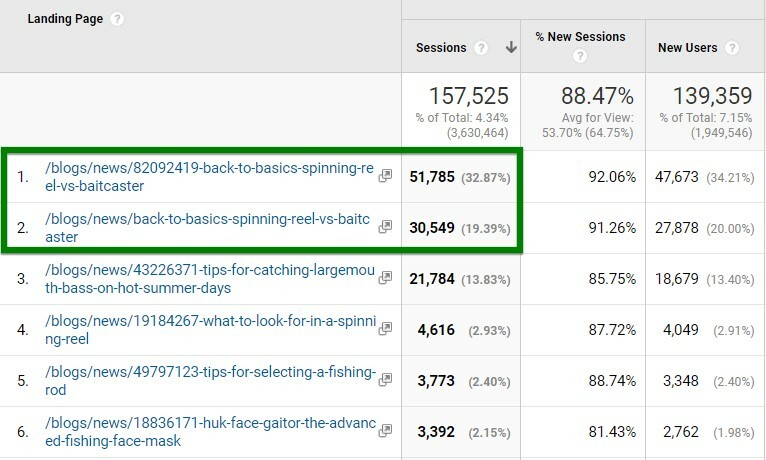 SEO Content Strategy – This keyword fit HUK’s educational style of blogs perfectly, so to capitalize on it, we produced a 100% unique piece of content that broke down the nuances of different reels and how to decide which is best for them. At the same time, we got to introduce the reader to HUK’s performance fishing apparel, which goes amazingly well with any reel they may choose. Content Rankings – “Position Zero” is a good thing that comes in the form of a Google Answer Box! Expect a lot more traffic when your content is featured in this manner. How much more traffic? When our content gets the “answer box” position, we typically see a 60-70% increase in traffic. It’s the Holy Grail for content results right now. SEO Content Results – Analytics/Channels/Organic/Landing-Pages/Blogs. We track all of our content so we can report to the client, adjust SEO techniques, update landing pages and look for opportunities to duplicate a winning combination. It’s fun to report that one blog is responsible for 82,000 visits in a 12 month period. 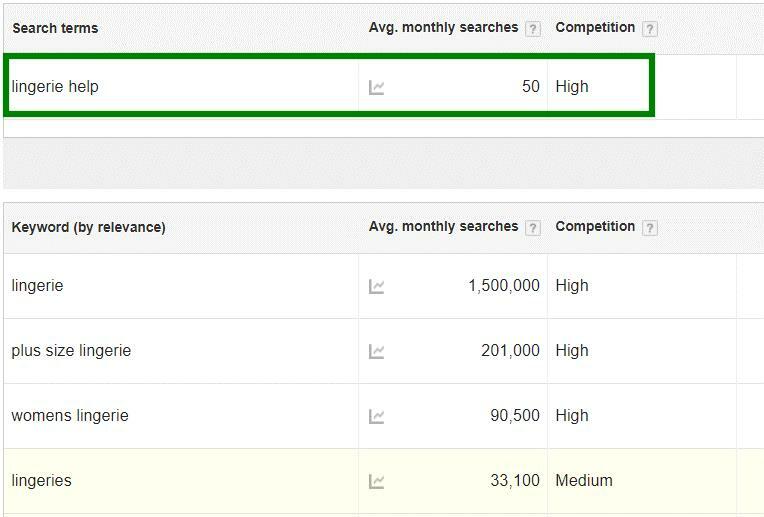 Keyword Research – 40 searches a month sounds low right? 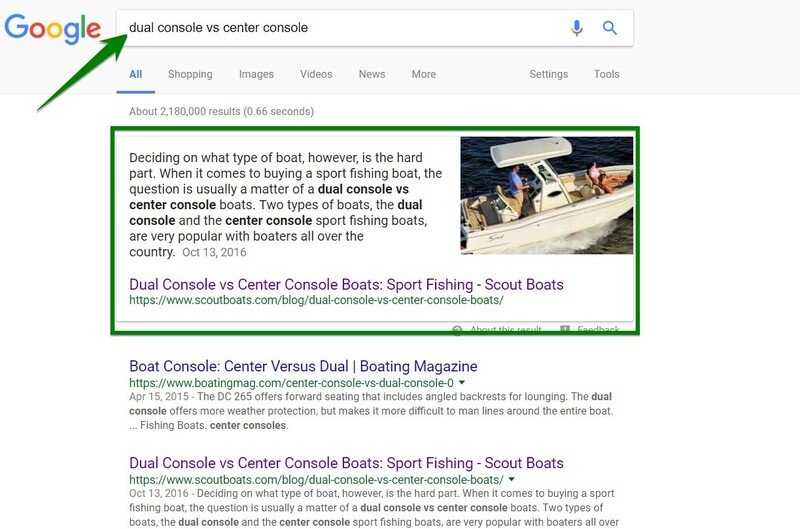 But what if you ended up ranking for dozens of related keywords such as: “dual console boats”, “best dual console boats”, “dual console fishing boats”, etc. Any SEO content marketing agency worth its saltwater knows that a great piece of content isn’t designed to rank well for only one keyword. It’s designed to rank well for dozens of valuable keywords. SEO Content Strategy – With this wave of search traffic in our sites, we created an informative blog post to reel them in. This piece was designed for first time boat shoppers, helping them to break down the family vs. fishing paradigm. The idea was to connect with potential buyers earlier in the funnel by addressing questions that come up in the research phase of boat shopping. In an effort to keep these visitors on the site longer, we pushed them toward a fun “Build Your Scout” page—and many obliged. Content Rankings – Thanks to this piece, we were rewarded again with a Google Answer Box—but that’s not all. 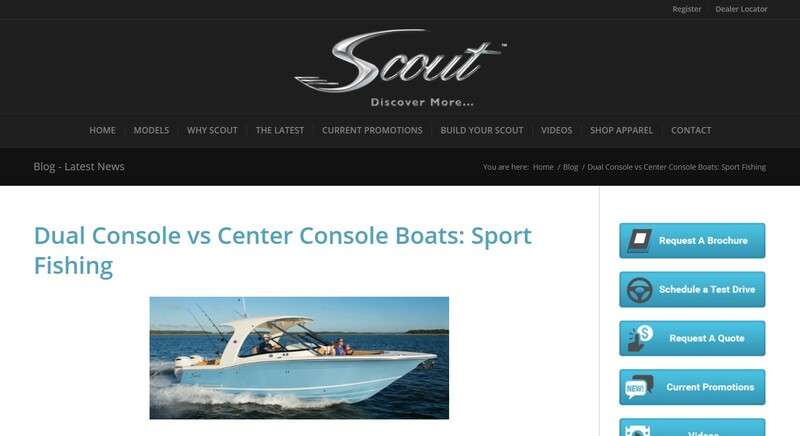 Scout is now ranking on page 1 for over 50 terms related to “dual console boats”! 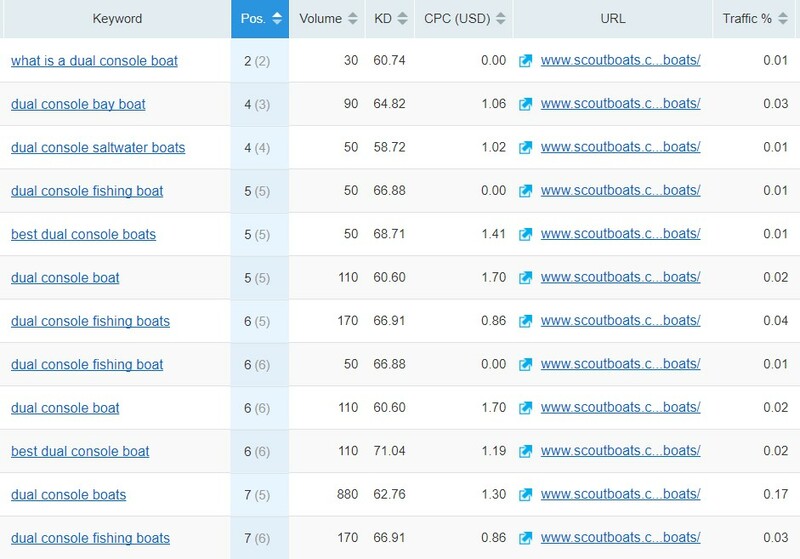 Additional Keyword Rankings – The traffic this content generated has resulted in Scout ranking for dozens of valuable keywords including “dual console boats,” which is searched 880 times per month according to SEMRush. SEO Content Results – This piece received 2,099 visits in 2017. On top of that, the client saw an 18% increase in organic traffic to their site over the previous year . Keyword Research – What’s being searched and how often? What’s the competition level? Does it match our content tilt? Can we improve upon what’s been published? Nectar is all about living the sweet life and doing epic things, so snowboarding was definitely a good fit. There was high competition, as is usually the case with shorter keywords, so we decided to go a little more longtail. 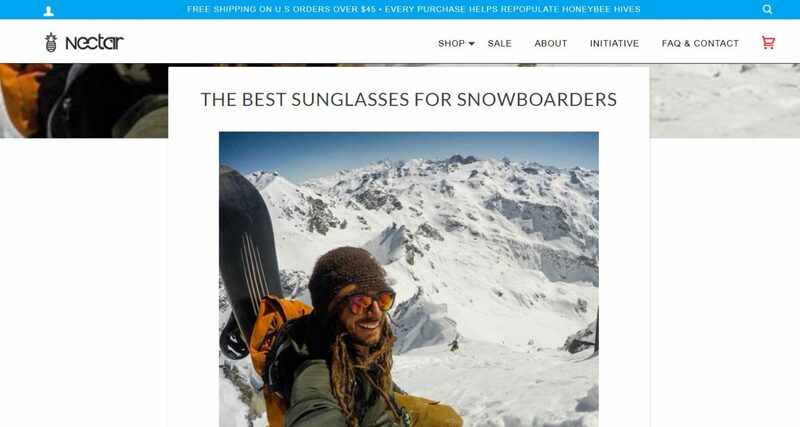 We targeted “best sunglasses for snowboarders”. 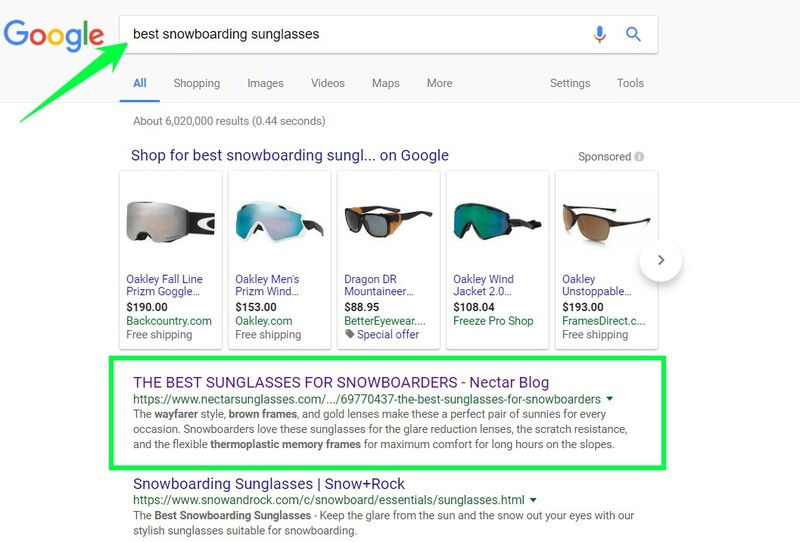 SEO Content Strategy – In our blog post, we featured 10 pairs of Nectar sunglasses that would pair well with the downhill daredevil lifestyle. It was all about highlighting the features and benefits in a light, humorous way. Polarized/UV Protective = Clear vision, reduce harmful rays. Plastic = flexible thermoplastic memory frames that make these an awesome choice for any snowboarder—especially after a faceplant. 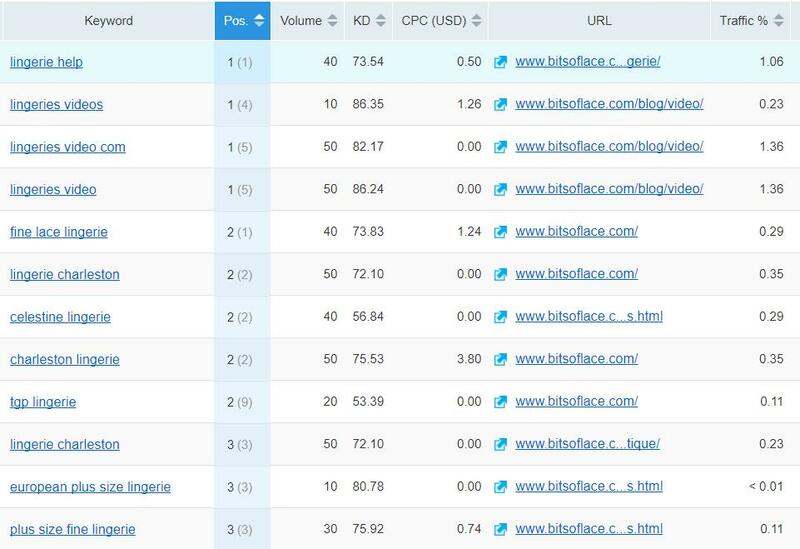 Content Rankings – We got to #1 for our main keyword phrase after a few weeks—but wait, it gets better. Like a snowball rolling downhill, this piece gathered clicks, visits, shares, and before long it was an avalanche of rankings and views and…you get the picture. It ranks for all the top terms related to “snowboarding and sunglasses”. 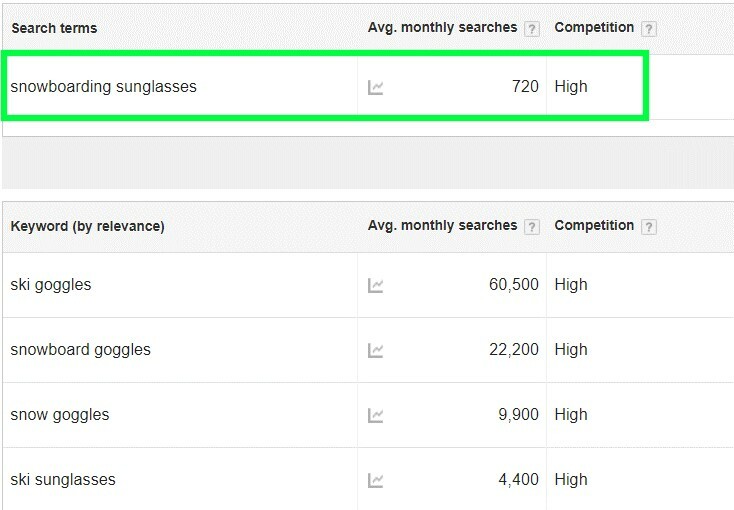 Additional Rankings – Remember that top term “snowboarding sunglasses” deemed as “High Comp” by Google. We decided to shoot just a bit lower and target “best”, remember? That got us the foothold we needed on the slippery slope that is SEO content marketing. Had we shot for the stars initially, we may have committed an epic faceplant and ended up buried on page 2. Bottom line? Longtail = Sweet life. 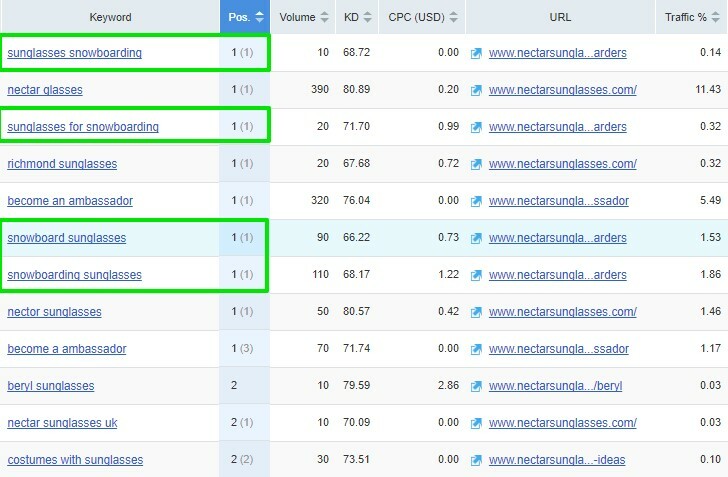 Snowball Effect – The SEMRUSH report below shows that our snowboarding content is responsible for 4 of Nectar’s top 7 rankings by position. Instead of waiting and hoping that snowboarders would discover the benefits of Nectar Sunglasses and tell the world, we told the world that Nectar offers the best sunglasses for snowboarders. They listened. 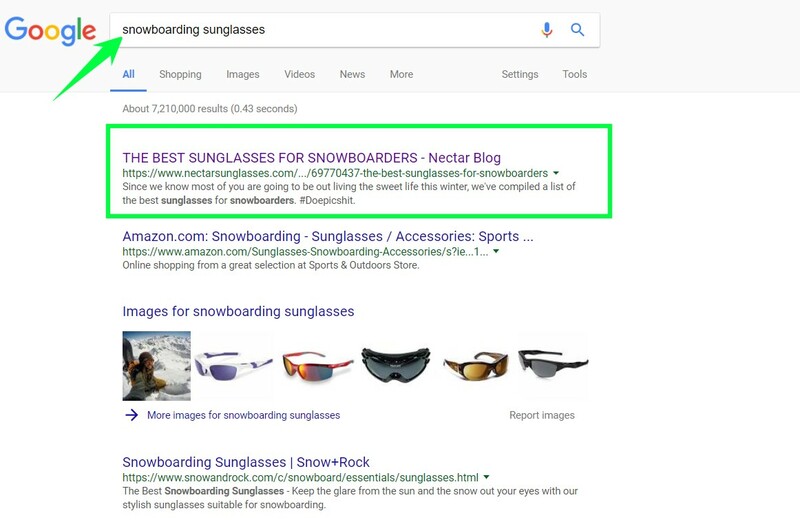 Nectar now ranks #1 for “snowboarding sunglasses” in addition to the longtail keyword we originally targeted. Start small and grow giant. 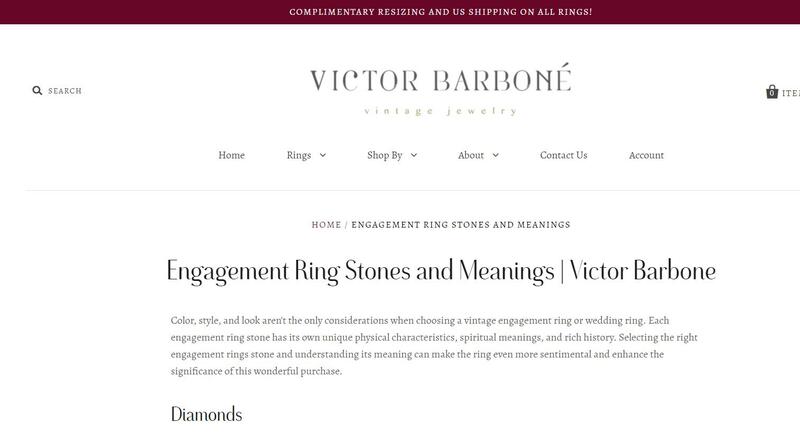 Keyword Research – Victor Barbone sells vintage engagement rings that can cost as much as $30k a pop. We felt that was reason enough to go a bit deeper than a simple product description. Did you know Aristotle claimed that merely possessing an emerald endowed the owner with a commanding presence guaranteeing victory in all manner of trials? We’re guaranteeing victory in all manner of content marketing! 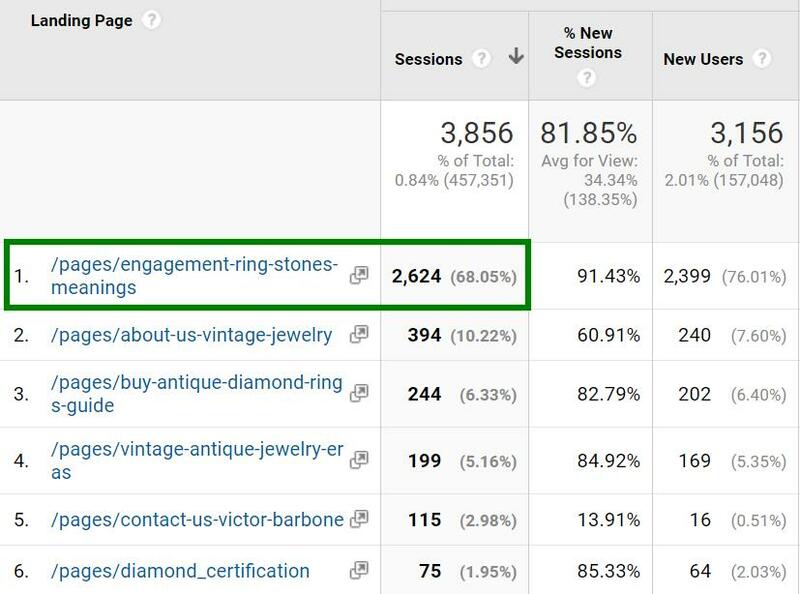 SEO Content Strategy – We found that the keyword “engagement ring stone meanings” had decent search traffic with some budging room in terms of competition. 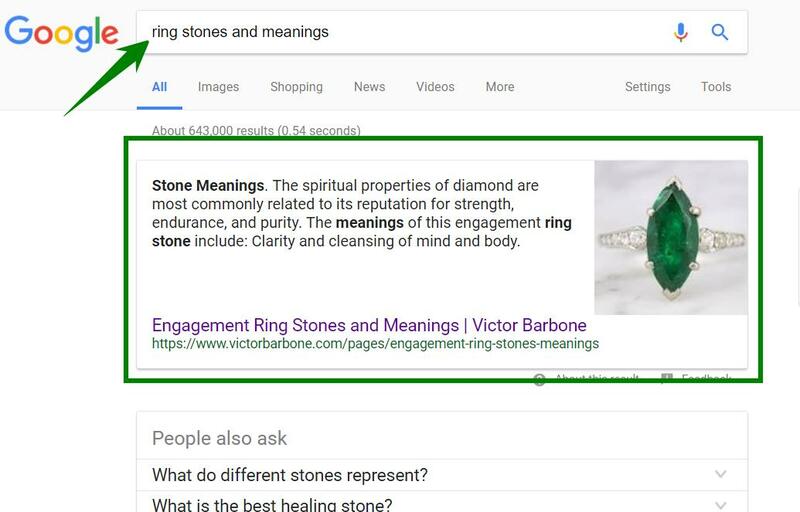 The idea behind the piece we ultimately produced was to provide useful information to Googler’s searching for the perfect engagement ring for their significant other. But we knew it wasn’t going to be easy. We had to go in-depth and do more than the other sites. Understanding that this content needed to be a “cut above” a typical blog, we gave it a home in the “shop by stone” section of the Victor Barbone website. Content Rankings – We were rewarded again with a Google Answer Box—but that’s not all. Victor Barbone is now ranking on page 1 for over 50 terms related to “ring stone meanings”. See below for more data. SEO Content Results – This piece received 2,624 visits in 2017. On top of that, Victor Barbone saw an organic traffic increase of 400% over the previous year. We won’t take all of the credit, but this growth is in part thanks to carefully targeted content pieces like this. And believe us, there are plenty more where this came from. 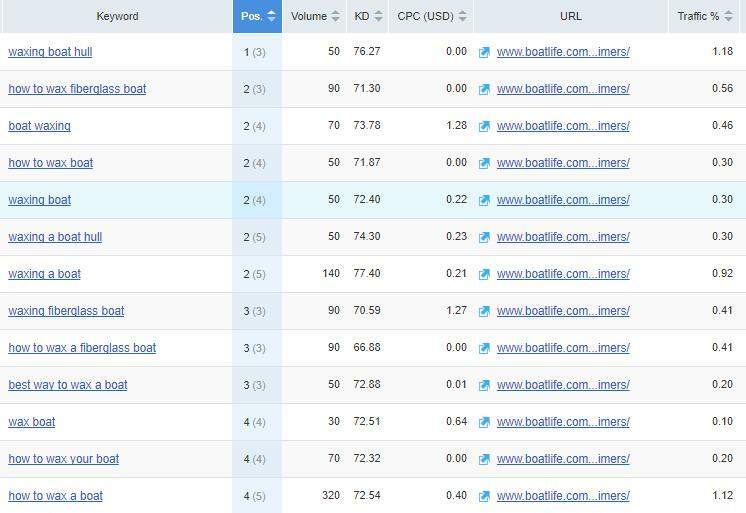 Keyword Research – What’s being searched and how often? What’s the competition level? Does it match our content tilt? Can we improve upon what’s been published? We just didn’t believe that “lingerie help” was “high competition” for our writers. Sometimes it’s okay to go with your gut. Variety is the spice of life after all, and not just in the bedroom. Variety of content has been known to woo Google. Keep it fresh people. 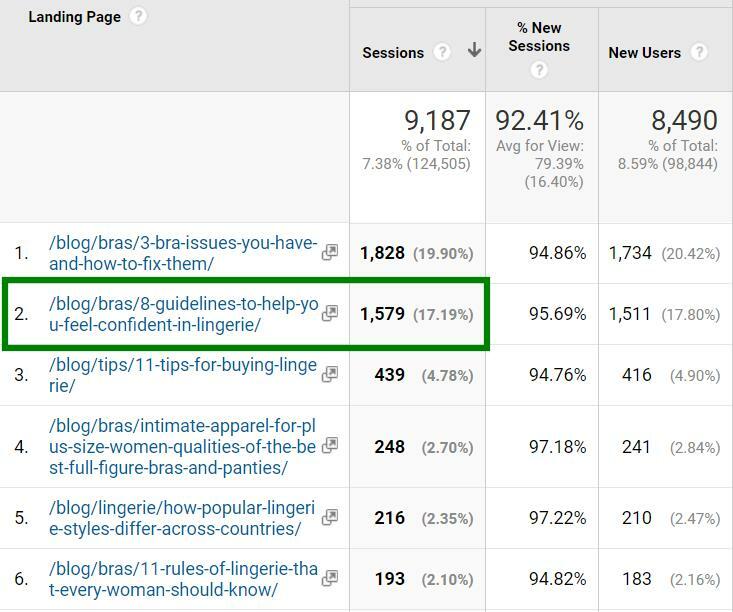 SEO Content Strategy – Bits of Lace has been known as the bra fit and style specialists for over 40 years now, so who better to offer a guide piece for wearing lingerie confidently? This post walks readers through the process of selecting the best lingerie for them and highlights the rewards that come with finding the perfect fit. 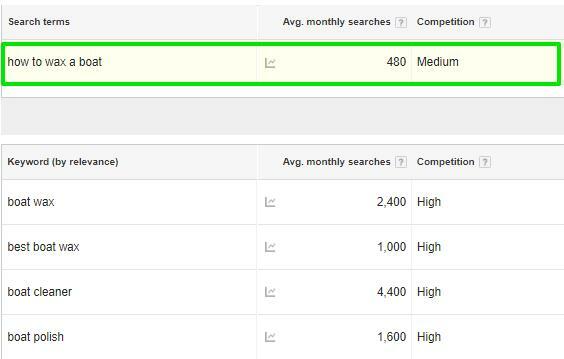 Content Rankings – #1 ain’t bad for a “high competition” level according to Google. And that’s not all. Bits of Lace is now ranking on page 1 for over 100 terms related to “lingerie” including “lingerie help” & “lingerie videos”. Let the games begin. 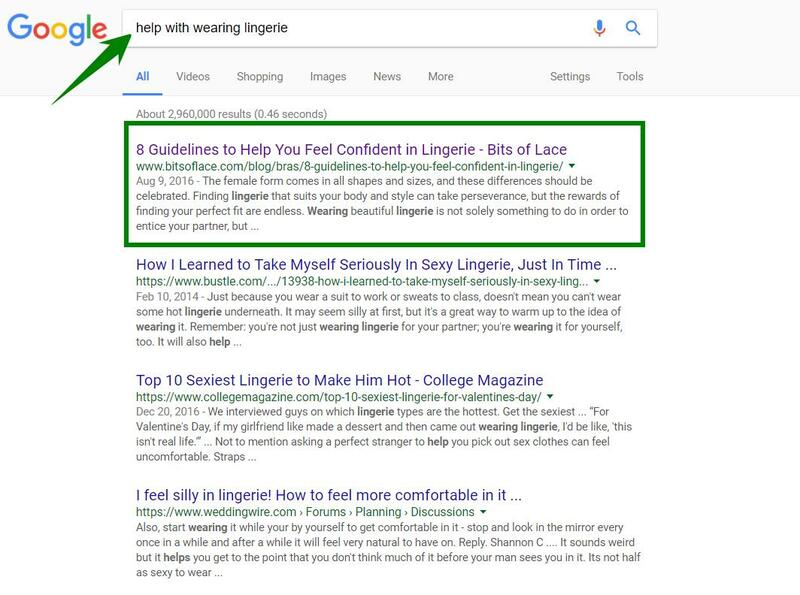 Additional Rankings – Thanks to consistent, highly targeted content production, Bits of Lace now ranks on page 1 for over 100 search terms related to lingerie. SEO Content Results – This particular post received 1,579 visits in 2017. The client’s blog traffic saw an overall increase of 37 percent over the prior year. 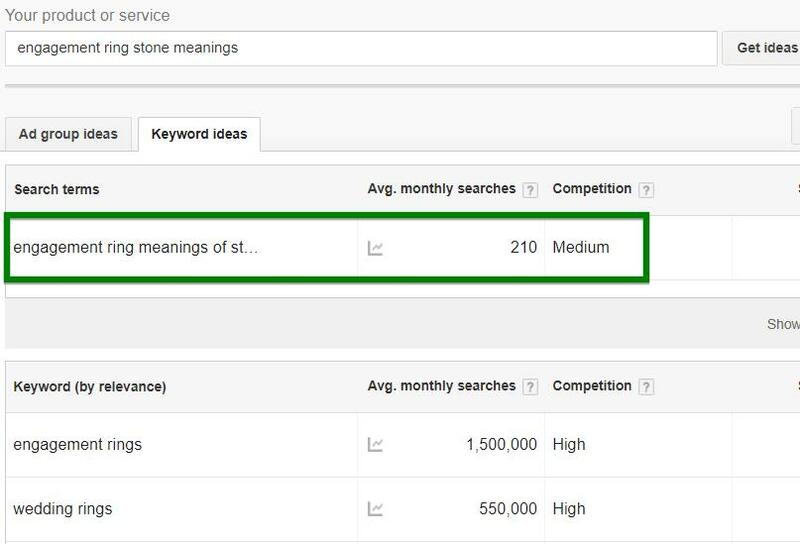 Keyword Research – What’s being searched and how often? What’s the competition level? Does it match our content tilt? Can we improve upon what was published? BoatLIFE sells boat wax. 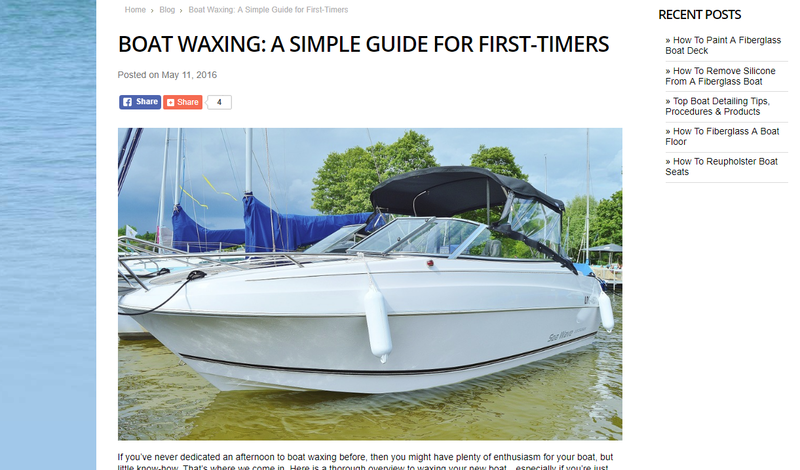 How could we not write the definitive piece of content on how to properly wax a boat? Daniel san, to become master of content, first must wax on, wax off. 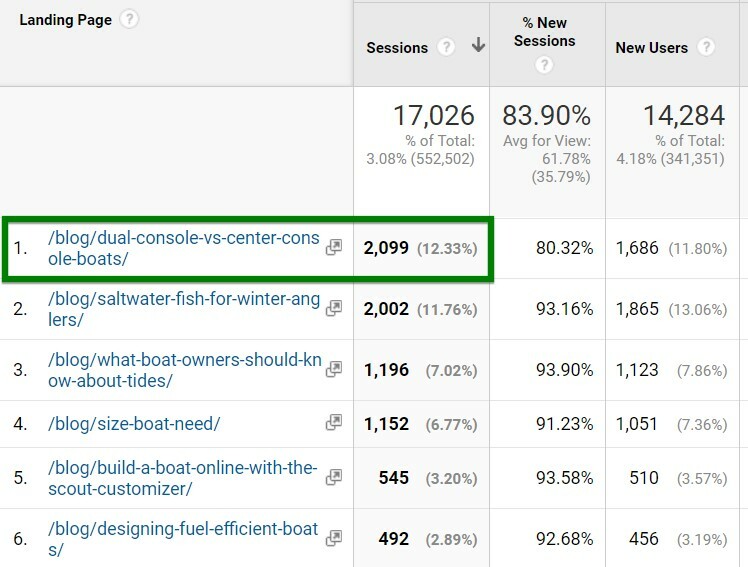 SEO Content Strategy – We produced a simple guide on how to wax a boat in the form of a 600 word blog post targeting first-timers. Bing, Bang, Boom. Content Rankings – Google rewarded us yet again with a Google Answer Box. 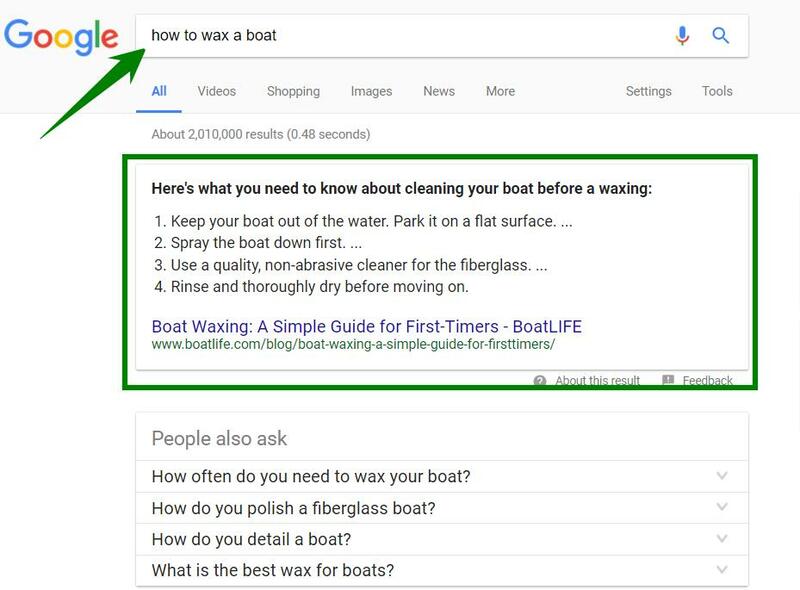 Plus, BoatLIFE is now ranking on page 1 for over 50 terms related to “waxing a boat” including “Boat Wax”, one of their core products!! That’s how you debate. Additional Rankings – This is a great example of how a great piece of content that’s targeting a specific keyword can bring traffic in from many other searches as well. This piece is ranking for a range of longtail keywords, pulling in terms like “hull”, “fiberglass”, “best way”, etc. 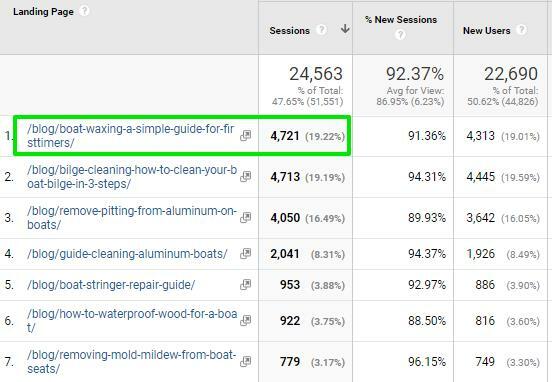 SEO Content Results – Our simple guide to waxing a boat brought BoatLIFE 4,721 visits in 2017. That’s not to mention all of the other content we produced. Overall, the client saw an organic traffic increase of 50% over the previous year. Ready to grow your business online? We’d love to showcase great results from your organization, too. for expert SEO content marketing services from ClickGiant. More clicks, more conversions, more customers.